Do you remember your first computer? Mine was a discontinued hand-me-down 1988 IBM PS/2 Model 30 Desktop with two floppy disk slots. We had to type nonsense codes in flashing green text before the screen booted up like we were entering secret ciphers or spells. Abracadabra /// enter enter enter, bring me to AOL please. What about your first laptop, iPod, iMac, iPhone, iPad? Do you use apps to tell you how you’re doing and when you’re doing it and if anyone else is doing those things too? Systems that track how many steps you are or are not taking in a single day? We might be on our way to becoming androids: half human/half tech. Try leaving home without your cell phone now. It’s unthinkable, like leaving home without an arm or a leg. This is the state of being that the new High Line Channel exhibition tackles: the eerie and shifting relationship between technology and humans. The program features the artists Nat Castañeda, Erica Scourti, and Aura Satz. The title, which comes from a Richard Brautigan poem, “All Watched Over by Machines of Loving Grace” from 1967, touches upon Brautigan’s before-his-time vision for a “cybernetic ecology” in which humans and computers live in “programming harmony.” He seemed to have predicted the future, or rather, the present that we’re currently living. 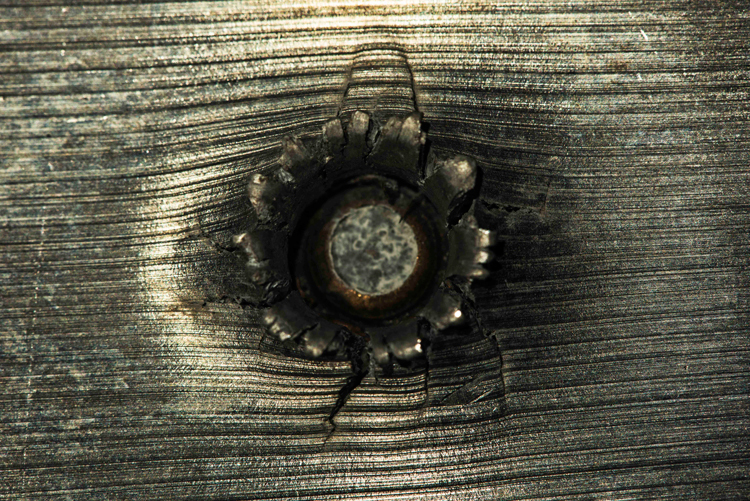 Aura Satz, Between the Bullet and the Hole, 2015 (still). Courtesy of the artist. In Between the Bullet and the Hole, Satz depicts the role of women in the early days of computing and ballistics through swift cuts of mathematical diagrams and sound wave imagery, among other found and new images. She winks at the long, yet invisible, link between women, military technology, and the development of computers. Just after WWII, government organizations began to hire women as human computers to make mechanical calculations of ballistic trajectories by hand. The employment was strategic—women were both highly trained in mathematics and substantially cheaper labor. Nat Castañeda, Static Background Radiation, 2014 (still). Courtesy of the artist. 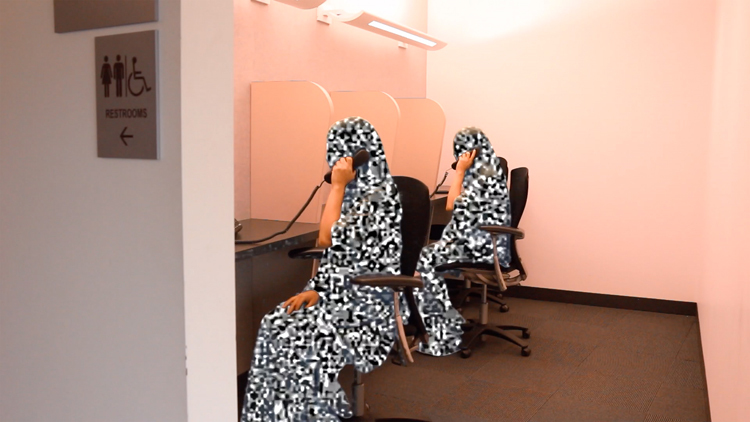 In Static Background Radiation (2014), Nat Castañeda rubs out and fills in the bodies of what she calls “The Static People” (and what appear as two women in burkas going about their office routines) with an overlay of generic black-and-white fuzz of a TV screen gone awry. This static, or electromagnetic noise pattern, was part and parcel of early television screens. According to Castañeda, “1% of the static noise on the television screen at any given time was a visual reverberation of leftover remnants of ancient light from the Big Bang fireball 13.7 billion years ago.” The women in the film are like ghosts in static shrouds, drinking coffee, filing, and taking and making landline phone calls. With Hot Readings (2018), Scourti creates over-the-top newsreel featurettes of her own social media profiles. The film is composed of screenshots and videos from a “personal archive” of Scourti’s entire online presence. Just like in our lives, she shows us a steady and constant stream of screenshots, Instagram stories, gibberish text messages, and newsfeed updates. Scourti’s chaotic social media stockpile mimics our lives’ evolution into pure algorithm: the scrolling text now stands in for her body. In watching these films, I thought of Janelle Monae’s cyborg alter ego, Cindi Mayweather. Monae/Mayweather has said that she relates the android to the Other, because “people are afraid of the Other and I believe we’re going to live in a world with androids because of technology and the way it advances.” For her, an android is a metaphor for the experience of anyone who feels like they’re on the outside: people of color, queer and trans people, immigrants, the poor, and also more broadly for the weirdos, the oddballs, and those who appear different than what we’re used to seeing on screens. 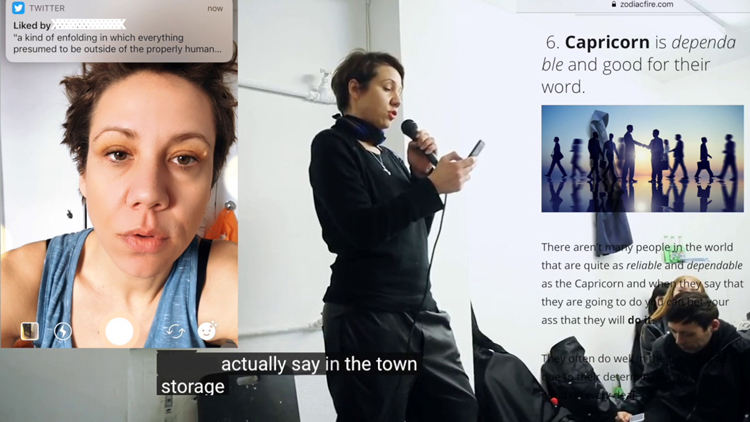 All three offer different variations of this new Other, this human-as-android: from Satz’ body-as-bullet/body-as-computer metaphors, to Castañeda’s bad cable box connection, to Scourti’s hallucinatory, sideshow-esque TED Talks. Maybe these in-between states are freeing for people who feel like they don’t fit in on this planet. The films in Machines of Loving Grace show us that our bodies are, for better or for worse, bound up in the technology we have created. Before I got my hands on my first computer I couldn’t imagine life with it, and now I can’t imagine life without what came after: high-speed internet, Google maps, text messages, and suggested search terms. Are we destined to become Static People living in an a-material world? Will Brautigan’s poetic prediction tip us into a space where our bodies become obsolete, our lives harmoniously uploaded in union with the cloud? Or maybe we’ll collapse under the overload of oversharing, the hyper-curation of social media identities, and we’ll hit control-alt-delete. Machines of Loving Grace runs daily beginning at dusk, now through January 2, 2019, on the High Line at 14th St.